When a day care center closed, Token, a box turtle who spent less than ideal time in a tank with sand and weird stuff for more than a couple years, was out on the street. Thanks to some turtle loving parents at the school, she ended up here... with a deformed beak, shell and toenails as a result of being confined in a horrible tank. Look who is new at our sanctuary! It's Token aka Pigeon (dead ringer for that bird). 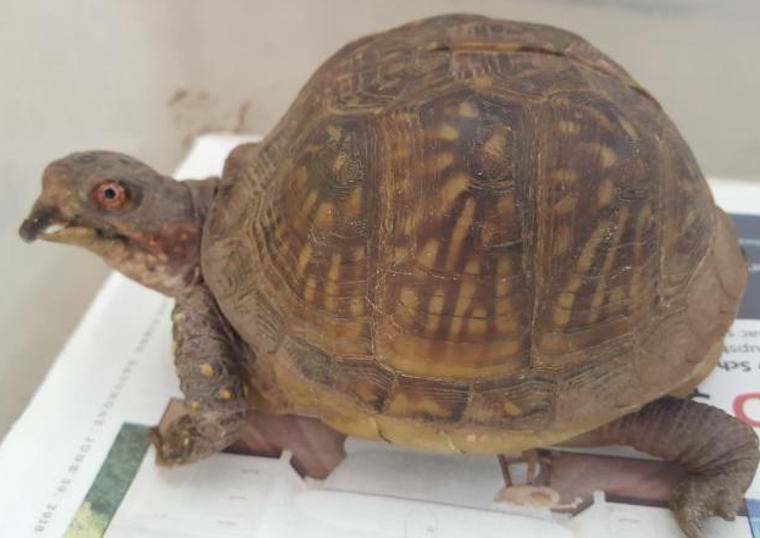 When a day care center closed, Token, a box turtle who spent less than ideal time in a tank with sand and weird stuff for more than a couple years, was out on the street. Thanks to some turtle loving parents at the school, she ended up here... with a deformed beak, shell and toenails as a result of being confined in a horrible tank. As our vet, Dr. Martin at Westlake Animal Hospital, said in this video as he clipped her twisted toenails, "Reptiles must live outside in natural sunlight." She obviously hates manicures. Her beak was too far gone to be shortened by Dr. Martin. Fortunately, she manages to eat worms and other food with it, though not easily. Now, she has a forever home outside here at the sanctuary.